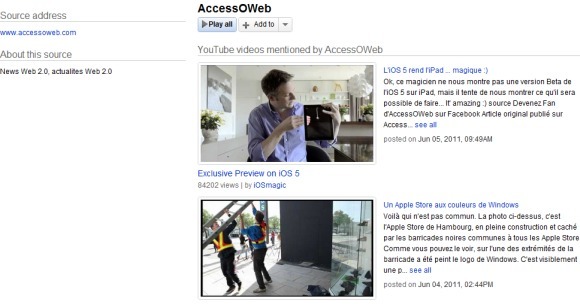 Philippe Lagane spotted a new YouTube feature: a special page that lists the most recent videos embedded by a blog. The page includes short snippets from the blog posts and allows you to play all the videos and add them to a playlist. A Google search for [site:youtube.com/social/blog] returns about 40 results, but it's likely that all the blogs indexed by Google will be included. The new pages could become an alternative to channels for blogs that embed content from other publishers. YouTube already has a section titled "popular around the Web" that includes the most viewed videos embedded on other websites and shows messages like "As seen on: engadget.com" next to the videos.